What a calm path to wander on a cold winter day. Maybe it was because I’m at the end of a moderately miserable cold, but I really wanted to visit the Marjorie McNeely Conservatory at Como Park this week. Luckily, I had two meetings in the Twin Cities today, with a nice spot of time between them to go soak up the warm, humid air. Even though the outside temperatures were mild for January (about 40 at midday), it felt wonderful to walk into the fern room and experience the sudden rush of warmth and humidity. My camera fogged up, so I had no choice but to settle down on a bench and just breath deeply. (My sinuses felt better already!) The sunken garden, one of my favorite parts of the conservatory, was closed as the conservatory crews took down the holiday display and put up the spring display — lots of bright, beautiful lilies, which may inspire a return trip. 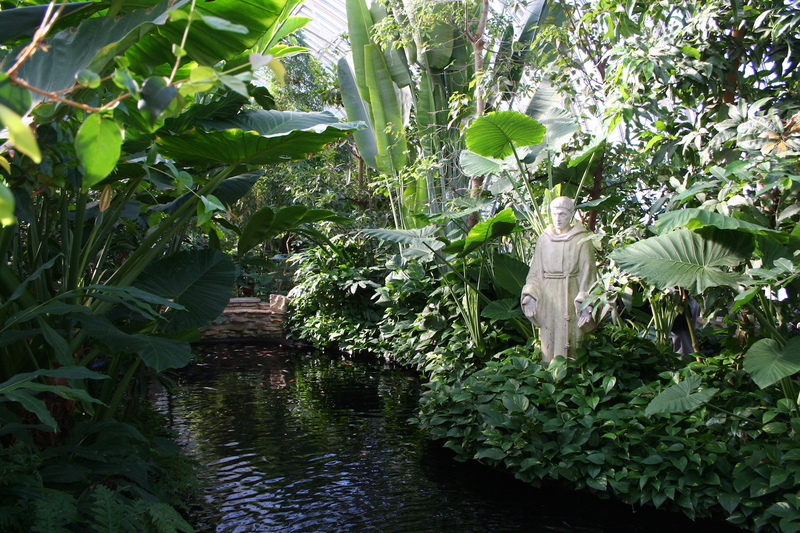 St. Francis watches over the pond. 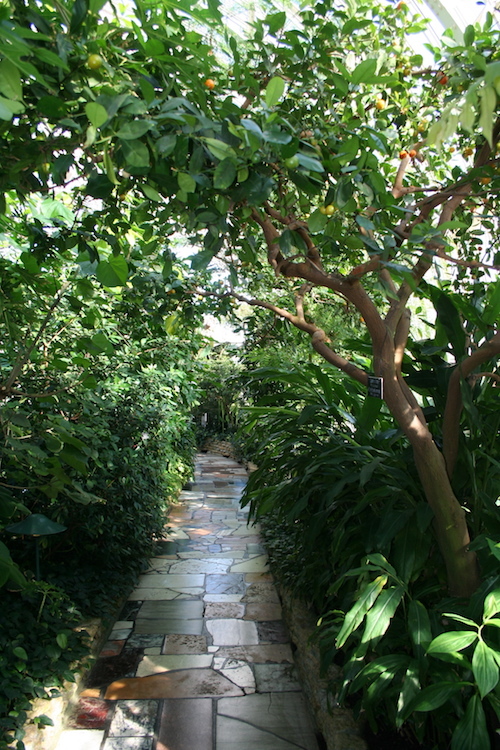 It was all green-on-green in the palm room and then I visited a room full of plants that produce the spices we love — an over-the-top-of-the-door vanilla vine, black pepper plant, ginger and other medicinal and useful plants. With a pool in the center, flanked by a statue of St. Francis, the room was calm and soothing. Francis is surrounded by Pothos, a common houseplant, that really thrives in the sun and humidity of the conservatory. 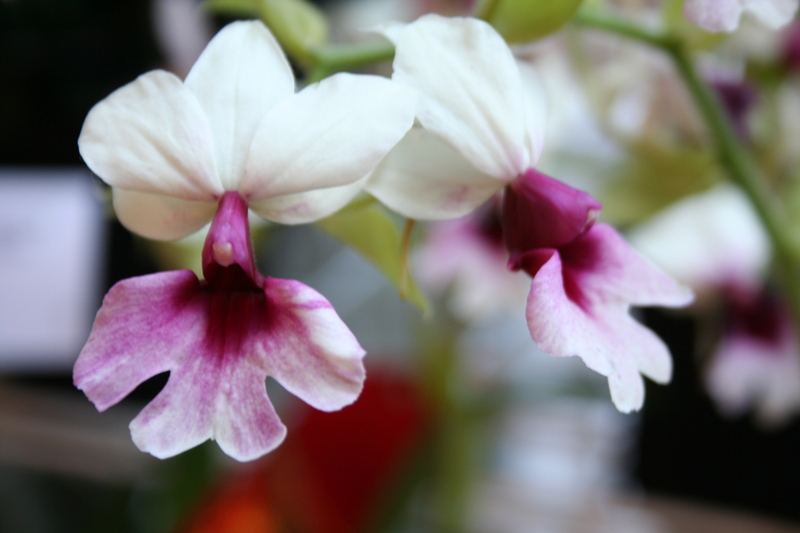 Later, I wandered into the room where the winners of a the conservatory’s orchid contest were displayed. The smell was glorious on one side of the room; pungent on the other — at least to my nose — and all the orchids were showstoppers. Soon it was time to head out to my next meeting. I left feeling refreshed and inspired. Years ago, my husband and I visited the orchid house at Longwood Gardens (a former Dupont estate in Kennett Square, PA). Thousands of blooms tumbling from perches built into walls, on tables, in beds, and spilling out of every imaginable type of container. Fragrances drifted from many of the varieties. It wasn’t the first time in my life that I realized the healing power of flowers, but it was one that remains picture-perfect in my mind to this day. My experience there confirmed that when I’m feeling low, I can visit plants — even at the local garden center — and get a pick-me-up. I’m glad you share the same motivation! Longwood Gardens is on my want-to-visit list. I’ve heard it’s spectacular. You are so right about the benefits of being surrounded by nature.